Scott Eisenberg, Imagine Dragons’ FOH mixer and live recording mixer, pictured with his Genelec 8240A SAM™ monitoring system. NATICK, MA, August 25, 2015 — Imagine Dragons has been keeping busy. The Las Vegas-based indie pop act, which has won two American Music Awards for Favorite Alternative Artist, a GRAMMY® Award for Best Rock Performance, five Billboard Music Awards, and a World Music Award, is currently on their Smoke + Mirrors tour, in support of the album of the same name. And as band frontman Dan Reynolds told Rolling Stone magazine in June, they’ve actually been more on the road than off since going out to support their 2012 Night Visions LP. However, that’s not stopping Imagine Dragons’ FOH mixer Scott Eisenberg from working on the mix of what may one day become an Imagine Dragons concert film shot at a show in Toronto earlier this year. When he’s done with mixing one night’s live show, Eisenberg will set up his mix rig in a hotel room or dressing room and work on the film mix. What’s enabling him to do that reliably, night after night, is a pair of Genelec 8250A SAM™ studio monitors with Genelec Loudspeaker Manager™ (GLM™) software. Together, they offer Eisenberg both the best-sounding monitoring system possible and one that will give him a consistent monitoring environment no matter where he’s working. 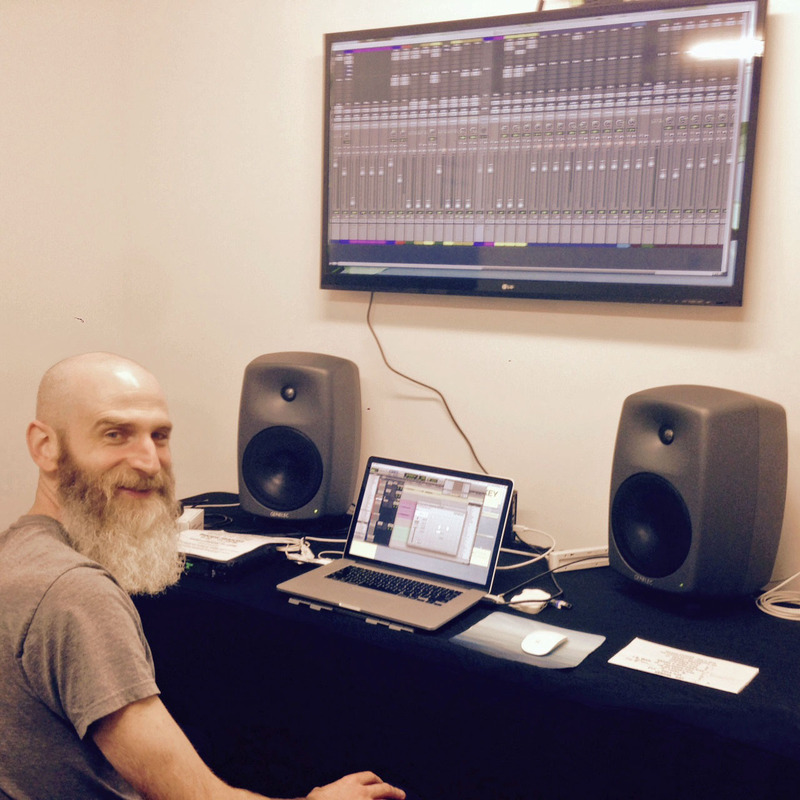 The 8250A monitors and GLM software were purchased from GC Pro in Sherman Oaks, California. “There’s no other way this could work as well,” says Eisenberg of this combination of Genelec technologies. After mixing the night’s concert through the Adamson Energia P.A. system on an Avid Profile console the tour is carrying, he finds a space he can get to work on the film-sound mix from the multitracks from the Avid Pro Tools system he uses to record the band’s shows. “I’m literally setting up a mix studio in hotel rooms and dressing rooms on the road,” he says. And every time he fires up the Pro Tools system, the sound he hears through the Genelec 8250A speakers is instantly familiar, enabling him to pick up exactly where he left off the day before. That’s because the GLM 2.0 Genelec Loudspeaker Manager’s highly intuitive and powerful monitor control networking system will electronically analyze whatever room he’s in, recall all parameters and settings he’s stored in system setup files, and then adapt them for the acoustical properties of that particular space at that particular time. The GLM software features adjustment of levels, distance delays and flexible room response compensation equalization using Genelec’s state-of-the-art and robust AutoCal™ calibration system. Genelec AutoCal is an integrated process for complete automated measurement, analysis and adjustment of every SAM monitor and subwoofer on the GLM network for either a single location (SinglePoint™), or for one-, two- or three-person mixing environments (MultiPoint™). GLM will adapt Genelec SAM monitors to various spaces, allowing reduced perceived differences between listening environments or positions, and providing automatic calibration of levels and distance-compensating delays for accurate and stable sound stage imaging. Photo Caption: Scott Eisenberg, Imagine Dragons’ FOH mixer and live recording mixer, pictured with his Genelec 8240A SAM™ monitoring system.